First off, enjoy the warmth and enduring performance of an outdoor heater. On chilly summer nights, ignite the Hatchlands Outdoor Heater to enjoy a beautiful ambiance of dancing flames, while the heat emanated from the cylinder top will provide you warmth. Nowadays, it is recommended to sit in the shade during peak hours of the day, as the sun emits harmful UV rays. Do you enjoy the sun, but want to be cautious between these hours? The perfect solution is a patio umbrella! The Oakengrove umbrella features a coral canopy with a slider mechanism that pivots as needed. The umbrella is perfect for shading adjacent lounge areas during the day. At night, it has solar-powered LED lights that shine below for an ambient-looking canopy. Coordinate your fire pit and other propane fueled accents with the remainder of your stylish outdoor space. The Hatchlands propane tank storagebox features a richly grained wood look, while acting as a secondary handy accent table or plant stand. It’s the perfect way to conceal a propane gas tank and to ensure all outdoor décor ties in together! All in all, the outdoor accessories will make your summer a memosrable one. Sit outdoors in comfort and luxury, just as you would expect in a 5-star resort! First is a sectional. This is a classic choice among people who like to entertain or simple have the space for extra seating in their backyard. Take the Peckham Park 4-piece outdoor sectional set for example. 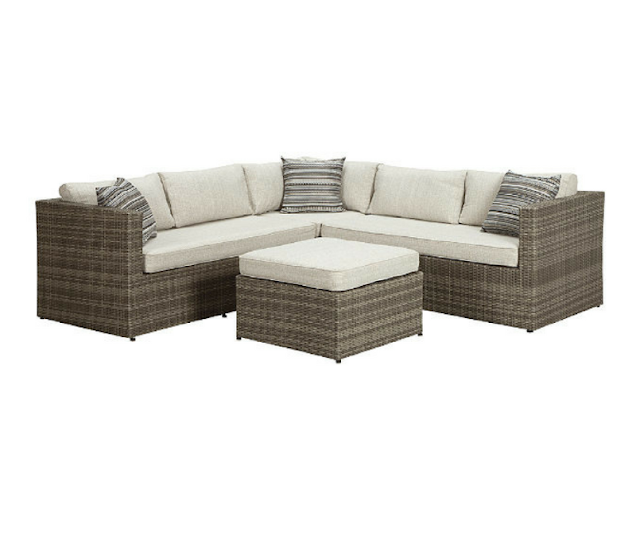 Drift away in the deeply cushioned comfort of this 4-piece outdoor sectional set. It’s sleek l-shape, along with the matching ottoman, are made for entertaining, reading or taking a nap on a beautiful sunny day. Driftwood-hued wicker, mixed with high performing cushions and throws will create an enhanced setting. Next, is a sofa or loveseat configuration which seats between 2-3 people. The Partanna loveseat will treat friends and family to rest and relaxation with its motion feature. Constructed of a durable aluminum frame and a chevron-woven wicker, the rocking base adds a delightful experience that will allow you and your guests to rock for hours. Get that country-feel right in your backyard! Finally, the last configuration to consider is a lounge chair. The Partannaoutdoor motion lounge chair will have you while away in peace and tranquility for hours. A lounge chair is perfect for relaxing if you happen to be a lone wolf, and can be paired easily with any other form of seating as the easy addition when in need! What kind of lounge seating do you see yourself choosing for your very own backyard resort? The moment you’ve been waiting for is finally here! Ashley Furniture has released their Outdoor Dining Furniturecollection. Bring the same indoor elegance to your outdoor space and create your own little bistro right in the comfort of your own backyard. Spruce it up with ornate, stylish and comfortable pieces that will be sure to last you for years to come! Now that you have your hands on affordable outdoor dining, narrow down your choice based on whether you plan to entertain a large group or if you intend to enjoy a quiet meal alone. A variety of sets are available to you to meet your needs! Hello morning lattes, delicious cocktails and gourmet meals in the sun! First and foremost, choosing a table that best suits your needs is a must! Depending on whether you plan to entertain or if you’re just looking to sit outdoors to soak up some rays, your intention will determine the size of table. Most outdoor dining tables are either rectangular or round. The number of seating ranges from 4-10 people. If you’re leaning toward a rectangular table, then you may want to consider the rustic Peachstone rectangular dining table. Its rectangular shape has a woodsy look you will love in a resilient rust-resistant aluminum frame. If you’re leaning toward a round-shaped table, opt for the beautiful Carmadelia round diningtable. Its glass tabletop is hand-painted to resemble leather, which is quite the visual treat. Next, you need to choose your form of seating. The current trend is either dining chairs or benches. If you’re looking for a more traditional look, then chairs are the way to go! Benches have a tendency to be on the modern side. If you want to go for an eclectic look, you can always opt for a mix of both! Of course, there is always the option to buy the matching dining chairs for the Peachstone & Carmadelia dining tables. You can always spice up the Peachstone seating by throwing a bench into the mix! The Moresdale bench is the ultimate option in terms of style and comfort. Its plush cushion will have you comfortable for hours! Don’t miss out on the release of these great outdoor dining furniture pieces. Make your backyard a beautiful retreat this summer! The Corraya panel headboard has all the markings of a modern masterpiece. The cherry grain outer frame oozes with extravagance and shapes the upholstered portion of the headboard. The contrast between both colors creates a dramatic statement. This headboard is perfect who prefer a little flair to their décor. Looking for that Hollywood regency glam in your bedroom? This tufted faux leather Alamadyre headboard makes a sophisticated statement, as it is accented with faux crystals for a touch of sheen. It screams glamour. Its clean and sleek lines make it a highly tasteful piece. The contemporary style upholstered bed is sure to awaken a platform for modern styling with a softer side. The fully upholstered headboard is plush to touch and easy on the eyes with its beautiful beige woven fabric and button tufting. This look will emanate a calming mood you long for in your bedroom. Get your serenity now! Clearly, upholstered headboards are gaining major popularity as they add a feeling of richness and grandeur in your bedroom. Aside from including a popular trend in your bedroom, the focus will be in the right area, on the most important piece of furniture in the space! Check out this braided beauty! The Dismuke rug is a handwoven jute and cotton rug. This weave features a tapestry of earth tones that is reminiscent of nature itself. The fact that it is handmade has a lesser impact on the environment, rather than if it was manufactured. Also, another benefit of using a natural rug is that you’ll avoid breathing the chemical particles that form when a synthetic rug is exposed to the sun. The versatile pouf has been a favorite for quite some time. Round out your space with the casually hip Dilip pouf. This piece features a cable knit cover crafted of natural jute. Its feel-good texture makes it a versatile spare seat, ottoman or end table; the perfect all-in-one eye candy. Paint a picture of easy relaxation in your space with the Odus wallart. The weathered plank-style layout features natural and black undertones, making it a very cool understatement. This charming piece will surely deck your walls with knockout style! Now that you have the facts about natural materials not only being a highly sought after trend, but also beneficial to your health, will you opt for this green lifestyle? Believe it or not, the all-white aesthetic has made the one of the top trends in 2017. It has become difficult to escape all-white homes and décor. Whether you love it or hate it, the effects of this trend are astounding which has caused quite the controversy. Long before the contemporary trend came up with its take on raw white, beautiful Greek, Moroccan and Scandinavian interiors utilized white walls for its sense of minimalism, and contrasted with colorful textiles and artwork. Now, raw white does not only reflect wall color, but a chalky or bone white quality seen in homeaccents. The organic and raw feel of these accents are great for balancing out a really vibrant space. A home accent that does raw white justice is definitely a beautiful white vase. The Kaemon vase has naturally flowing swirls that have a wonderful organic feel. You can also opt for a vase that says “minimal fuss” and gives maximum impact with a clean and simple shape. The Daemyn vase can wow on its own, with its simple cylindrical shape. Picture frames are not only a way to treasure memories via a quality framework, but it’s also a means to add style and substances to the picture. The Baback frame features a beautiful organic white with ribbed detailing that brings out quite the snappy texture. Another elegant frame is the Kaelem, as its glazed ceramic surface is buzzing with a clean vibe that is worthy of the raw white principle. Finally, another accent to complete the raw white look in your home is a delightful throw that is reminiscent of a ribbed sweater knit. The Clarence throw has a chic and classic appeal features a thick fringe that is full of texture. The all-white trend will remain beloved for years to come, as it has already been around for quite some time. What do you think about this trend? Muted colors are those which lack vibrancy or saturation. They tend to lean toward the more subdued end of the spectrum, while still creating a chic look with their subtlety. It seems that the muted colors of 2017 are mellow, but with a little more pigment than the pastel-looking hues that were in last year. In fact, the colors are perhaps more dusky in nature which emits a rich and warm feel to a space. Let’s take a look at how some of these serene and soothing colors can still manage to warm up a room. People have a tendency of finding new ways to bring elements from the outside into their homes with a sense of style. There is something about combining earthy colors into a space that is not only reminiscent of nature, but that creates a calm and collected atmosphere. A perfect example of these colors is taupe and a muted earthy green. Especially taupe or similar hues would be a great choice for upholstery on beds, sofas, chairs and even rugs! It’s a color that will remain timeless, and therefore would be a great investment when it comes to furniture. Among the other popular muted colors this year is dusky blue and in a variety of hues. It is slightly muted and quite sophisticated and reminiscent of the beach, but without falling into a kitschy category. Although this shade of blue is far from being bold, it would still be wise to use to accessorize your home. Opt for bedding,decorative pillows, throws, ottomans, etc. These pieces entail a much smaller investment. Not just on the runway, but in home décor, shades of gray are the getting the attention they deserve. Grays in particular create a refined look in the home. Despite being a neutral tone, it is quite rich. Just like earthy tones, gray is equally a good choice for furniture pieces that you intend to keep for years to come. However, it has more of a modern feel to it. What do you think about muted colors in your home? Is it something you would consider? Simple theme. Theme images by chichi. Powered by Blogger.